In 1910, John Fischer, a German sausage maker opened the first meat shop in Issaquah, Washington. John’s two boys, Nick and George, grew up working in their dad’s meat shop and took over the business when their father retired in the 1950’s. The two sons continued to operate the business until 1981, when Chris & Jacque Chiechi bought the business from them. Chris started working in his uncle’s butcher shop when he was 14 so buying Fischer Meats fulfilled his life-long dream. Chris is still working in the shop and looks forward to serving all of his Issaquah and Seattle area customers for many years to come. He wants to personally invite any one who hasn't yet tried Fischer Meats to stop in and give them a try. "We have been customers of Fischer Meats for 20 years. 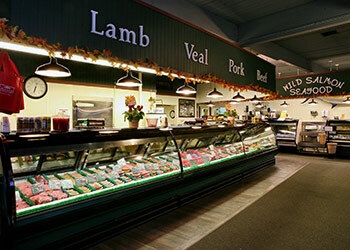 Their quality, selection and service surpass any other source for meats. As long as they are here, all of our meat will come from Fischers!" 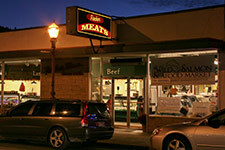 In 2010, Fischer Meats celebrated 100 years in business in Issaquah Washington. 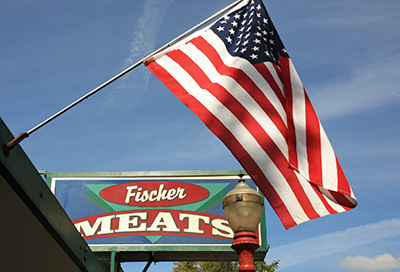 As the oldest business in Issaquah, Fischer Meats has seen some changes over the years but the two things that never change are the quality of our meats and our outstanding customer service. As a family owned business, we understand wanting to serve your family and friends only the best and that’s why we insist on carrying only quality cuts of meat. Fischer Meats is owned and operated by trained butchers, who will cut meat to order and take the time to explain the differences between specific cuts of meat. If you aren’t sure what you need, our experienced staff is always willing to help you with your choice by explaining the difference between cuts of meat. We’ll even give you cooking tips so that your meal will turn out great. Whether you are looking for-porterhouse steaks for your family, smoked sausages for a barbeque or a special cut of roast, our staff will go out of their way to make sure you are satisfied. If you’re in a hurry, we welcome our customers to email or phone in their order ahead of time so that it can be ready when you arrive. We do whatever we can to accommodate our customers-that’s the Fischer Meats way. If you're a hunter, you'll be glad to know that we offer wild game processing with custom service so all you need to do is request your special cuts when you bring in your game. If you are looking for a specific cut of meat and don’t see it in our display case, please ask us about it. We are always happy to oblige special requests and will do what we can for you. Fischer Meats is known for our high level of service. In fact, it’s one of the reasons our customers keep coming back to us year after year.